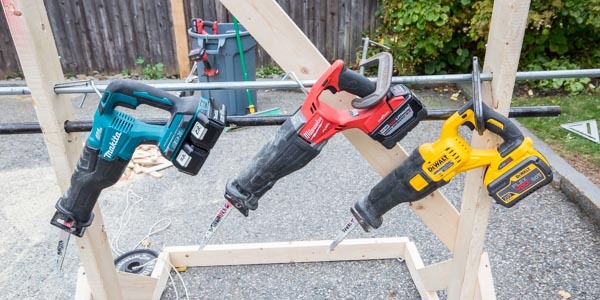 We recently did a cordless reciprocating saw head-to-head where we tested 10 different tools that all use a single battery in the 18V-22V range. We felt it was important to keep the lineup of models in the same voltage range to give a fair side by side comparison. 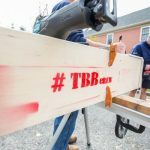 While we still feel that was the right thing to do, many readers felt strongly that we should have included the DEWALT 60V FlexVolt and the Makita X2 18V reciprocating saws. So we decided to take the winner of the first test, the Milwaukee M18 FUEL Sawzall and put it up against the two higher voltage saws in the 60V and 36V options listed above. We’re calling this the battle of the “High Capacity” cordless reciprocating saws. 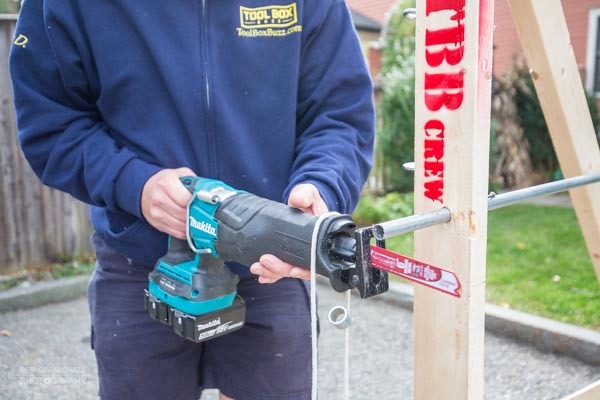 Once again we feel that the reciprocating saw is one of the most widely used power tools in construction and touches so many different trades. 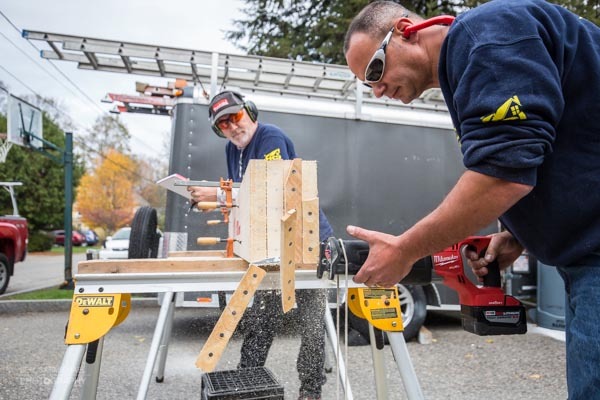 So will the Milwaukee Sawzall using an 18V platform keep up or even beat these high voltage models? Read on to find out! We’ve listed the basic specifications for these tools, a link to their web page, and the batteries that were used in the test. 3/4″ Gas Pipe – This test is relevant specifically to plumbing and heating contractors. 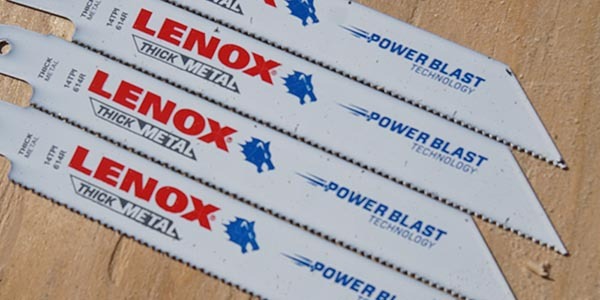 We used new 6″ Lenox 14TPI blades designed for thick metal in each saw and took the average time for 5 cuts. Note: We first ran this test with some Diablo blades (shown in some of the photos), however we re-ran all the tests using the blades listed here to match the previous testing we did. 1/2″ EMT Conduit – In this test we simulated a task that electricians perform on a regular basis. 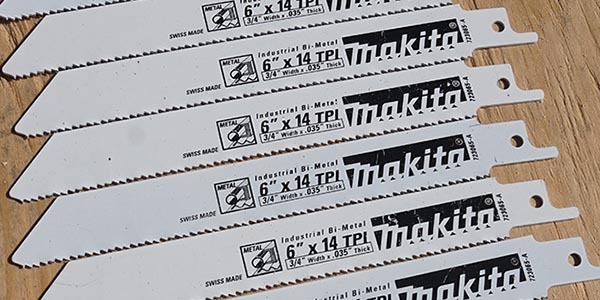 We used new 6″ Makita 14TPI industrial bi-metal blades in each saw and took the average time for 5 cuts. Note: We first ran this test with some Diablo blades (shown in some of the photos), however we re-ran all the tests using the blades listed here to match the previous testing we did. 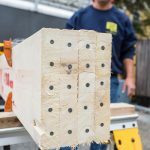 Nail Embedded Wood – Here we nailed four (4) 2×10 joists together and then installed five (5) 16d nails in each 2×10 for a total of twenty (20) nails. So for each cut we plowed the blade through four nail-embedded 2x10s. 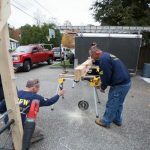 This simulates heavy-duty demolition cutting for carpenters, remodelers and general contractors. 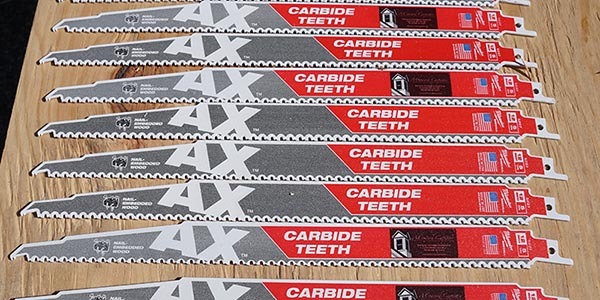 We used a new 9″ Milwaukee AX carbide-toothed 5TPI blade designed for nail-embedded wood in each saw and took the average time for 5 cuts. In an effort to obtain similar cutting pressure applied to each saw we hung a 11 lb weight from a rope situated on the forward grip of each reciprocating saw. Testers started the cut with both hands on the saw, then released the front hand to allow the 10 lb weight to pull the blade through the cut. This method was used for all the tests. Also, some of these saws include a variable speed option. We performed each of these speed tests at the highest speed setting. The Milwaukee One-Key® allows users to adjust the speed settings on the saw. We performed the tests using the highest factory applied speed setting. 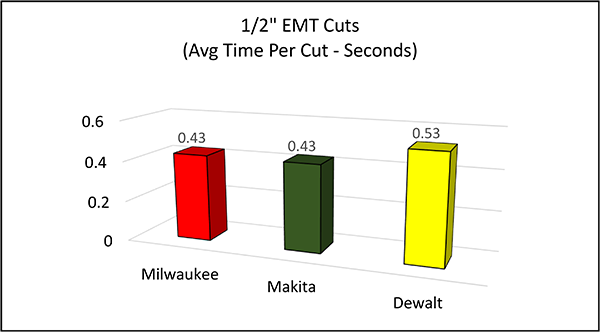 Makita came out on top in this test with an average cut time of 3.0 seconds. All three saws boast the same blade speed but the Makita has a slightly longer blade stroke at 1-1/4″. The results are all within about 10% of each other so the performance of all three saws very close. 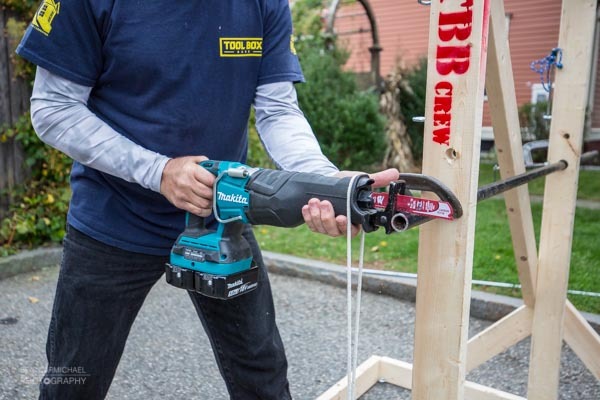 For this test both the Makita and the Milwaukee tied with an average cut speed of 0.43 seconds. 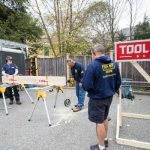 Again these results point to three saws that are very closely matched with speed and stroke and powerful motors that maintain that speed in these applications. 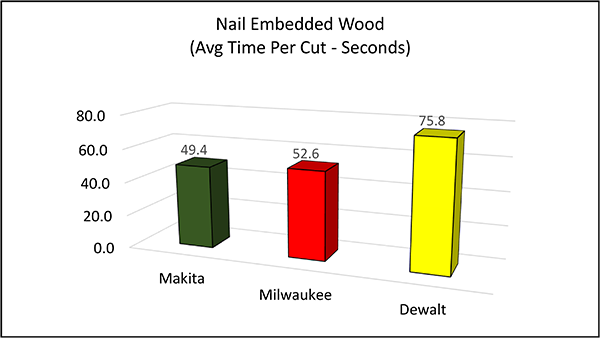 The DEWALT was only one tenth of a second behind which is still within about 10% of the other two saws. 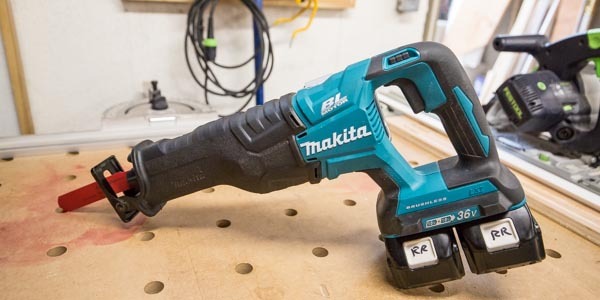 In this test Makita was the clear winner with an average cut speed of 49.4 seconds followed closely by Milwaukee with 52.6 seconds (approximately 6% difference). 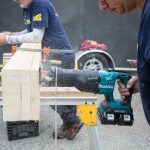 The bigger surprise here was the results from DEWALT which posted an average cut speed of 75.8 seconds. At 25% slower the DEWALT wasn’t able to keep the blade speed up under this difficult cutting application. Over the course of a day of demolition that extra time could sure add up. 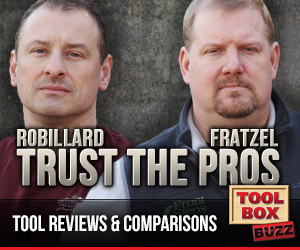 When we do our head-to-head testing we often get questions about the actual tool performance compared to published “specifications”. 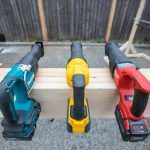 For this article, we wanted to look at how these cordless reciprocating saws performed compared to their published results. Reciprocating saws have two major variables; speed (strokes per minute), and stroke length (distance the blade travels). Theoretically saws that go the fastest and have the furthest blade travel should cut material quicker than saws with lower values. For this assumption to hold true, the saws would need to have the same power output from the motor. 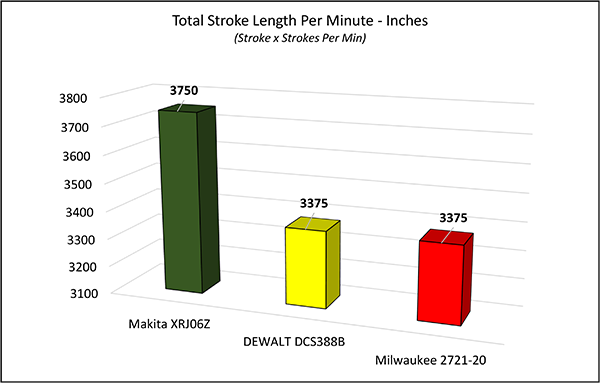 Below is a chart showing the Stroke Length in inches multiplied by the Stroke Speed in strokes per minute to define the Total Stroke Length per minute. One very important note about this chart; the speed of the saw is from published data for no load on the tool (in other words no pressure from cutting material). The next chart shows the total ranking of the 3 tests we performed. This was calculated by adding up all the scores for all three tests. Makita got a score of 3 because it placed 1st in each test (1+1+1=3). The lower the total score the better the tool did overall in the three tests. This is just a relative ranking to show how they did on speed tests. Unlike the previous test with 10 different saws, in this situation the published results seem to follow our test results pretty well. It’s very important to note that we only performed 3 different tests and there are arguably thousands of tests you could perform on reciprocating saws and those results would vary from ours. But what is important is realizing that the published specifications on a tool don’t always result in the same performance when used on the job site. When we put the DEWALT to the heavy duty cutting application, it didn’t do as well as the other two even though on paper it appears to be quite similar. 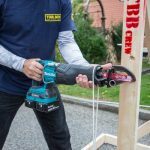 The ergonomics of power tools is vitally important to performance and user productivity. 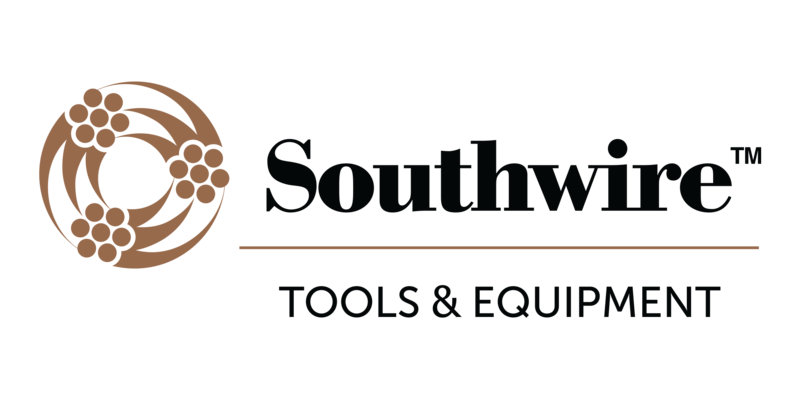 We ranked the three saws with regards to ergonomics from comments provided by our group of testers after using the tools during the tests above. 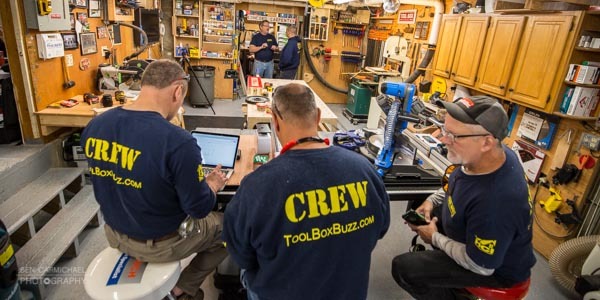 We evaluated the tools based on the following: Grip, Overmold, Balance, Vibration, Blade Change, Battery Location, LED, Weight, Controls, and the Rafter Hook (or lack of). 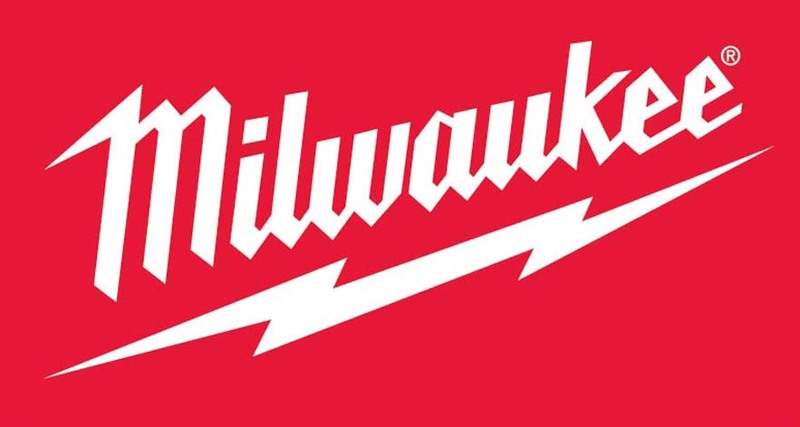 Milwaukee 2721-20– The Milwaukee came in first overall for ergonomics. It scored first place for; overmold, balance, vibration, battery location, LED, weight, controls, and it’s rafter hook. It finished in second place for the blade change feature and came in third for it’s grip. Also, this saw features the ONE-KEY™ system which allows users to customize the saws blade speed using the ONE-KEY™ app. This can make a bid difference in cutting performance and vibration. Makita XRJ06Z – Makita came in second overall for ergonomics. It scored a first place for weight and it’s rafter hook (both were tied with Milwaukee). It came in second for the grip, overmold, balance, vibration, battery location and the controls. Finally, it finished in third place for the blade change, and LED. DEWALT DCS388B –Third overall was the DEWALT which finished first in the grip and blade change feature. It came in second place for the LED light and finished third in the overmold, balance, vibration, battery location, weight, controls and it doesn’t have a rafter hook which we feel is a big miss. 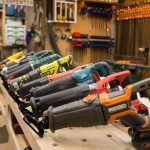 It’s always hard to compare the pricing of cordless tools especially when each manufacturer packages them differently with kits, bare tools, and then varying size batteries. DEWALT DCS388B: This was a bare tool ($179) combined with a 60V 9.0 Ah Battery Pack / Charger Combo ($207) for a total price of $386. 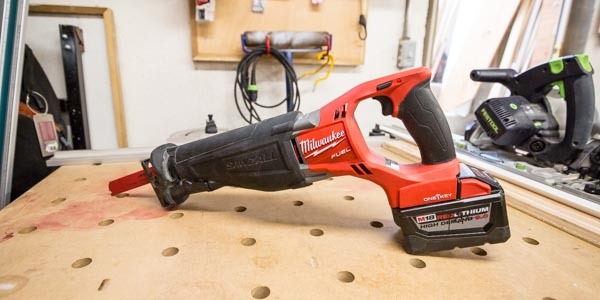 Milwaukee 2721-20: This was a bare tool ($249) combined with an 18V 9.0 Ah Battery Pack / Charger Combo ($199) for a total price of $448. Makita XRJ06Z: This was a bare tool ($190) combined with (2) 18V 5.0 Ah Battery Packs / Charger Combo ($259) for a total price of $449. When it comes to pricing and value we have to rank the DEWALT DCS388B the best value. Also, if you look around there are some great deals right now on combo packs of the 60V 9.0 Ah double packs for $199 which makes it an even better deal! (Not sure how long those deals will last though). For about $60 more (which isn’t a lot when you’re spending this much) you can get into either of the other two saws, and considering how well they performed in our tests you’ll have a tough choice to make. Obviously if you’re in one of the other platforms already then the decision becomes much easier. Additionally, the Milwaukee comes with the ONE-KEY™ system which offers features the other two saws do not have. ONE-KEY™ allows users to track their tools last known location and more importantly set custom blade speeds to match blades with the base material. With this feature users can cut tough materials like stainless steel and cast-iron far more efficiently that saws without that feature. ONE-KEY™ also allows users a soft start cutting option for metal cutting and a cut brake, which stops the blade once the blade is free from the material. 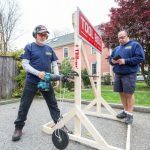 We should probably say the winner of this test are the contractors who can now buy cordless reciprocating saws that easily keep up with their older corded ancestors! 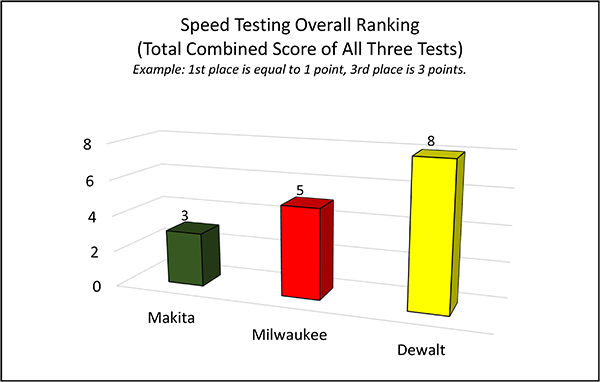 This test was so very close and when we compared all the categories we evaluated we ended with a tie between Makita and Milwaukee. To calculate the final score we awarded a number (1 for first place, 2 for second place and 3 for third place) for each category (three speed tests, ergonomics and price). 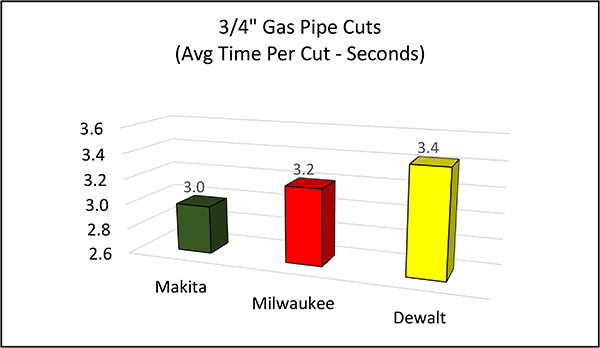 We added all the scores and the two saws with the lowest overall tie score were Makita and Milwaukee. Makita and Milwaukee stayed true to their core users by sticking with their 18V platforms and not pushing users to a new battery to get this amount of power and performance. While the double battery configuration of Makita is a bit bulky, the performance speaks for itself. Milwaukee users can use a high demand 9.0 Ah pack or they can user a lighter small 18V pack if they choose. 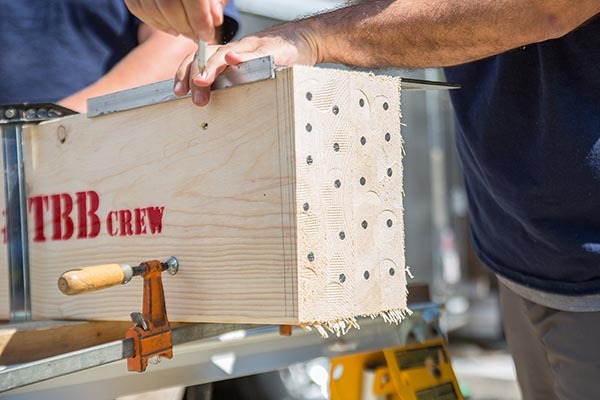 While we didn’t consider this in the overall evaluation, the ONE-KEY™ system brings advanced features to the Milwaukee saw which some could easily argue that it’s the best overall choice. 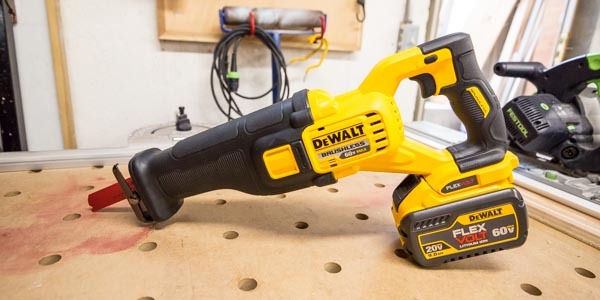 The DEWALT DCS388B is an excellent cordless reciprocating saw. While it lagged behind the Makita and Milwaukee slightly in our testing it does come in a bit cheaper. This saw boasts one of the best grips in the industry. 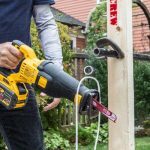 We do feel the saw is missing an extremely important feature without a rafter hook (DEWALT has elected to drop this feature on several of their new FLEXVOLT tools and we think this is a critical oversight). The other downside to this tool is you have to run it on the new 60V battery packs as it will not run on the 20V packs that have been around for quite some time. 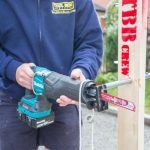 In the past few months we’ve now reviewed 12 cordless reciprocating saws and the top two overall are the Makita XRJ06Z and the Milwaukee 2721-20. These two saws are so impressive with respect to power and performance. These tools are clearly designed to handle any commercial or residential application. 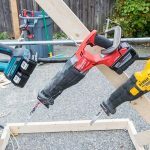 While the DEWALT finished in second place, it’s also a workhorse that cannot be ignored. 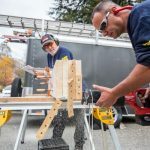 The big take away from this testing is the fact that most of these cordless reciprocating saws perform at a level consistent with older corded reciprocating saws. 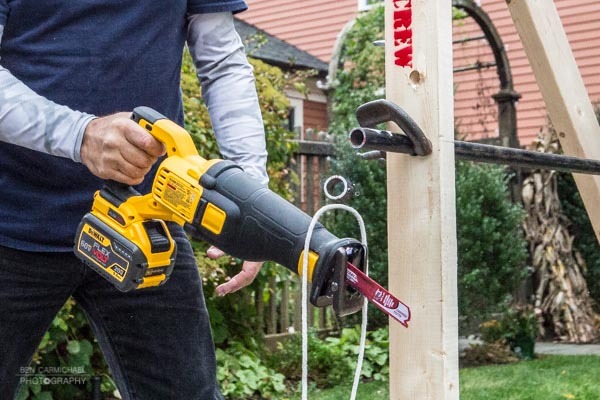 Cordless reciprocating saws have finally cut the cord and we can all benefit from that! 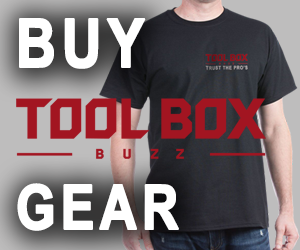 If you haven’t bought one yet, it’s time to cut that cord and free yourself to move about the job site with ease! The bare tool Makita was massively cheaper then the Milwaukee, and the total package was one dollar more than the milwaukee. That clearly makes the Makita a greater value not withstanding the fact that it won or tied every category for performance. One 9ah times 18 volts is 162whr vs Makita 2ea. 5ah times 18 volts is 216whr. I dont know about the package cited above, but to the best of my knowledge, all the x2(two battery tools) kits come with a dual charger which will charge 2 5.0ah batteries in 45 minutes(almost half the charge time for the 9.0ah battery). Just a couple thoughts. Jay – It’s always hard picking winners for this. The good news is we show all the data for each category so guys like you can make your own decisions. 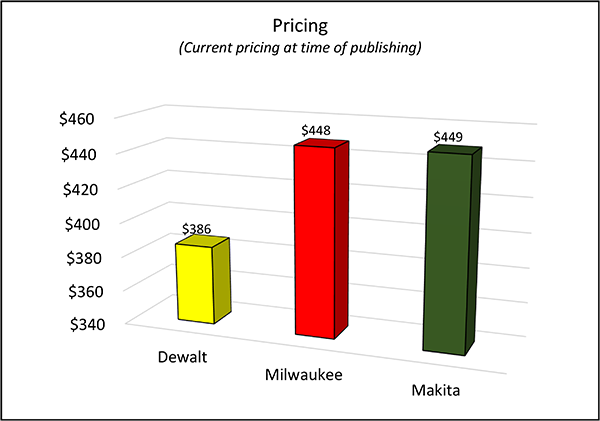 Pricing is tough, it changes all the time, this article is over a year old, likely the pricing has changed since then. At the end of the day, we try to show a bunch of data, we make the rankings that we feel are appropriate, but ultimately you guys can use our data to make your own choices. Thanks for sharing your thoughts. Todd, thanks for the reply, I’m embarrassed of how whiny my post sounds. I’m a big fan of all your(TBB’s) work, and greatly appreciate all the thorough testing and documentation. Just had one more question, I was going through the numbers again and noticed, although you used the same test for both the regular and high capacity saws(for the wood with nails), and the same Milwaukee saw(the only difference being 5.0(ah) battery vs 9.0 battery), in the regular test the average time came in the 30’s(seconds) but in the high cap test it came in the 50’s. I would understand if it was the 5.0 getting the slower time due to the fact that they used to make the 5’s with the lower discharge cells, but it was the 9.0ah with the slower time. That leaves me perplexed. Do you have any idea why? Softer wood maybe? I understand it was a while ago, but thought you may have some insight. Thanks again for all you guys do! Keep it up. Jay – I’ll try to look into the data. I need to confirm if we had the same blades, same material, etc. you guys have the coolest jobs ever. If only this was our full time job 😉 Thanks!